David Price auditions MAD's top silver interconnect and Clearer Audio's new entry level power distribution bar, while Adam Smith listens to the sound of silence with Advanced Acoustics' Orbis sound damping panels! A bumper twelve pages of your views and queries this month! David Price has a fine time with these high end metal coned standmounters. 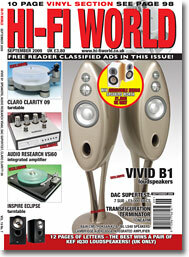 Noel Keywood compares B&W's CM5, JBL's LS40 and Roksan's TR-5 compact standmounting loudspeakers. A marvelously musical pair of premium priced floorstanders, reviewed by David Price. Noel Keywood auditions this quirky high end sub/sat speaker system package. David Price is bowled over by this punchy sounding new tube integrated. Noel Keywood tunes in to this high quality mid-price multichannel AV receiver. Paul Rigby tries the latest incarnation of a popular budget integrated. Paul Rigby tries digital-to-analogue convertors from Russ Andrews, Musical Fidelity, Beresford, Cambridge Audio, MGL Audio, Stello and Benchmark. Patrick Cleasby tries a superb new high end Network Attached Storage device. Tim Jarman compares Sony�s new digital portable to its illustrious predecessors. Paul Rigby tries the latest Astin Trew CD player/amplifier with Spendor speakers. Adam Smith auditions this brand new turntable from a brand new manufacturer, and finds it a most promising start. This fascinating new parallel tracking tonearm gets its first review from Adam Smith. This enigmatic, high quality turntable made in a limited run of only thirty pieces is reviewed by Adam Smith. Our favourtie classic kit listed for your perusal. Your chance to win a pair of superb Audiosmile Kensai loudspeakers, worth �1,500! ...and finally, Paul Rigby takes a walk on the wild side this month, with Edward Ka-Spel's 'O�er a Shalabast�r Tyde Strolt Ay' from 2003!